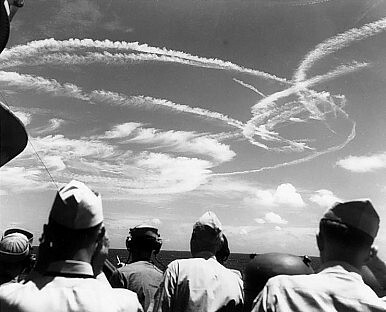 Fighter plane contrails mark the sky over Task Force 58 during the "Great Marianas Turkey Shoot" on June 19, 1944. Photographed from on board the USS Birmingham (CL-62) during the Battle of the Philippine Sea. 1944’s Battle of Philippine Sea holds some interesting lessons for how we think about military power. Ben Ho Wan Beng’s excellent recap in The Diplomat of 1944’s Battle of Philippine Sea holds some interesting lessons for how we think about military power and how learning affects the prospects of victory in battle. Ben ably works through the tactical details and dilemmas of the battle, leaving space for working through some of the broader strategic and institutional lessons. In this context, what’s really interesting about the Battle of Philippine Sea is how key factors in the balance between U.S. and Japanese forces changed between 1942 and 1944. The decisive weapons of both the Battle of Midway (June 1942) and the Battle of Philippine Sea (June 1944) were aircraft carriers and their warplanes. Surface ships and submarines played important, but supporting, roles in both battles. In 1942, the Imperial Japanese Navy had major advantages in aircraft and pilot training, the fruit of a meticulously designed system for connecting the best human capital with the best technology Japanese industry had to offer. These advantages made it exceedingly dangerous to tangle with Japanese naval aviators. Still, American forces could more than hold their own under many circumstances; Japanese advantages were not so overwhelming that they precluded other decisive factors in battle. By 1944, these advantages had vanished. The overall expertise of the Japanese naval aviation corps had declined because of wartime losses (especially in the Guadalcanal slog), and American pilots had gotten much better. Moreover, American industrial superiority had transformed the technological situation. The U.S. Navy air arm at Midway had consisted primarily of Grumman Wildcat fighters, Douglas Dauntless dive bombers, and Douglas Devastator torpedo bombers. Although effective enough at the time, by 1944 these had been replaced by Grumman Hellcats, Curtiss Helldivers, and Grumman Avengers. Doctrine had also changed; USN combat air patrol procedures benefited from years of learning, both experimental and experiential. The upshot was that in 1942, carrier combat between the U.S. Navy and Imperial Japanese Navy was dynamic and unpredictable, enabling a smaller force to win a massive victory if it enjoyed certain advantages (luck, intel, and surprise). This stood in contrast to normal surface combat, which heavily favored the side with numbers. By 1944 this situation no longer held; the Americans had effectively routinized carrier combat such that unpredictable victories were no longer possible. How does this matter for thinking about the balance between U.S. and Chinese power today in the Western Pacific? The first lesson is that advantages can dissipate, and even reverse, more quickly than anyone expects. The elements that had made Kido Butai (the Imperial Japanese Navy’s carrier force) the most lethal naval unit on the planet in 1942 no longer existed, and, in fact, had been entirely superseded by 1944. This lesson should serve as a warning to both China and the United States. The second lesson is that wartime learning illuminates critical deficiencies and opportunities, allowing flexible military organizations to take advantage of new information and build new capabilities. While everyone expects that a China-U.S. conflict would end quickly, the Japanese believed the same of the Pacific War. The U.S. Navy, with greater resources and more institutional dynamism, made up for early errors to become a far more lethal organization.